The zero waste lifestyle has log since been an interest of mine and, in the last month or so, I’ve really started putting my research and interest to work. I’ve reduced my use of paper towels drastically as well as my purchasing of plastic-wrapped and pre-packaged goods when possible. One of the things I’ve been struggling with most is in the beauty area. 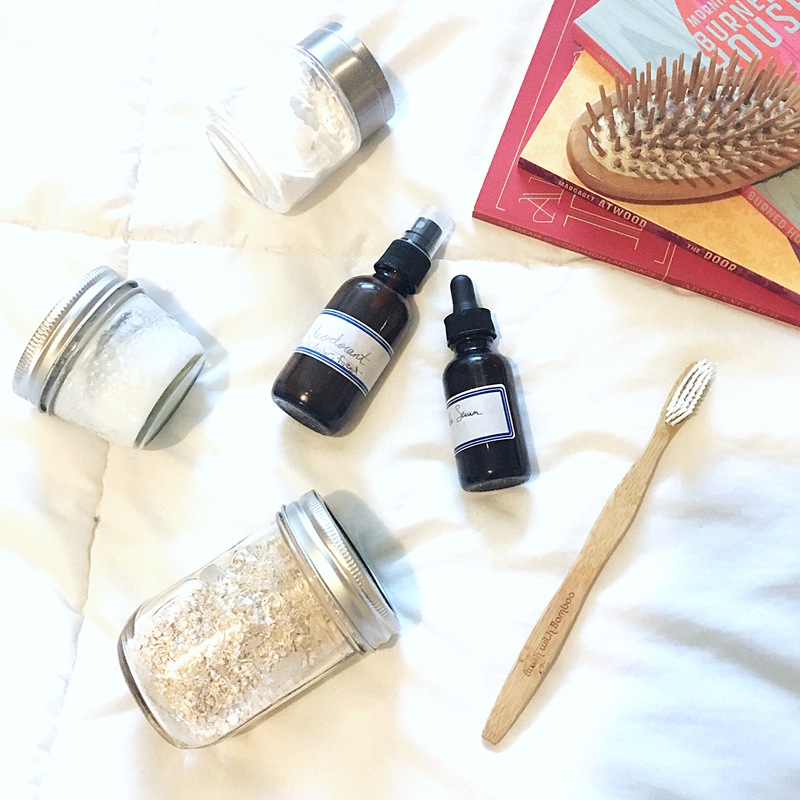 I love green beauty and the idea of going as natural as possible so why not make my own skincare? Oats – I read online that they are super moisturizing and, when ground slightly, they are also great as a gentle exfoliator. I use them in the shower every second day or so to give my face a good cleanse. They also double as a mask if you want to leave them on for a while. To use, you just mix a little of the ground oats in your hand with water and apply. Serum – I researched quite a lot of different oils before making this one. In case essential oils and carrier oils aren’t your thing, different oils do different things and have a variety of different benefits. This serum is a mixture of jojoba oil and rosehip oil with a little lavender. I use it to moisturize my skin andto help with my acne scars. 4-in-1 Spray – This one deserves its own post I think. It’s a 4-in-1 disinfectant and facial spray that is absolutely amazing! I use it to deodorize my gym bag, disinfect my yoga mat, as a facial spray, and as a deodorant when necessary. I’ve used it so much that I’m actually on my second batch of the stuff! Sweet Almond Oil – This is what takes my makeup off every night. It smells sweet and oil is actually great for breaking up extra sebum on your skin. Sebum is what causes clogged pores. It doubles as a moisturizer so it cuts out that step completely. It’s 2 for the price of 1! Arrowroot Flour – This isn’t necessarily skincare but it’s still easy, cheap and works great! Arrowroot flour makes a great dry shampoo. You can mix it with a bit of cocoa powder to make it better for darker hair if you like, I have done this with cornstarch instead of arrowroot – it does work well and, as a bonus, you smell like chocolate all day! 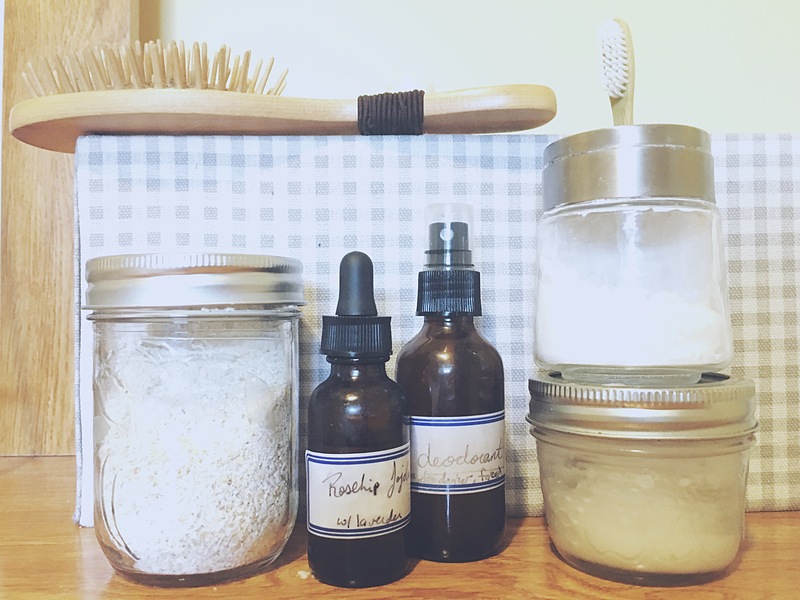 Homemade Toothpaste – I finally decided to make my own toothpaste! My journey with “green” toothpastes could be its own post but let’s just say I finally found one that makes my teeth feel clean. The recipe I used is from Lauren Singer. She runs a blog called “Trash is for Tossers”. 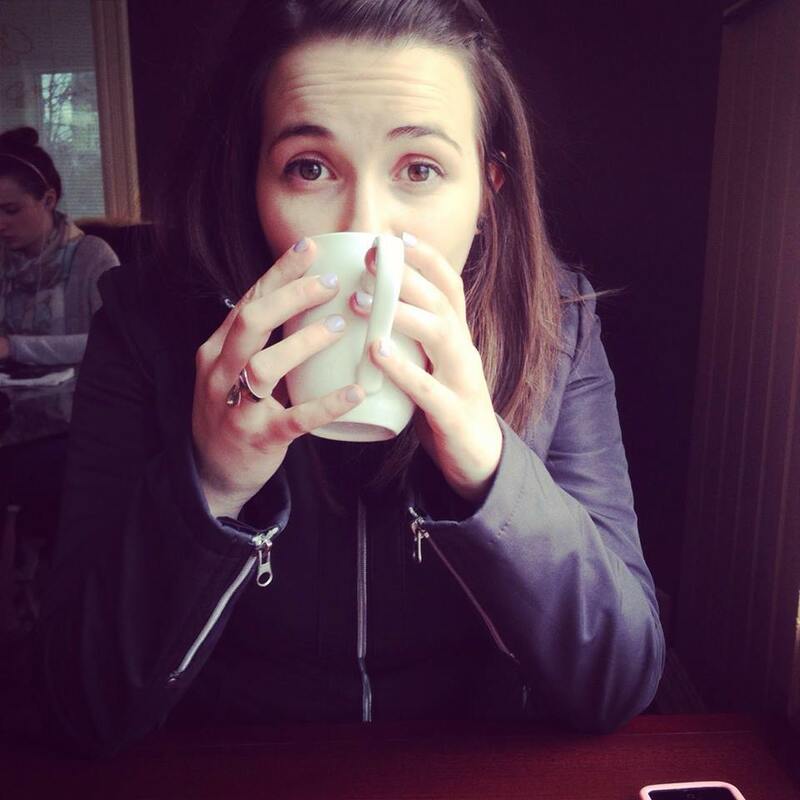 She has some amazing zero waste tips and recipes and her blog is definitely worth a read! Another switch I’ve made is to more sustainable care items as well. Most hair brushes are made entirely of plastic or from a combination of plastic and animal (boar) hair bristles. This one is mostly wood with the exception of the plastic holding the bristles. Wooden bristles are better for your hair as they evenly distribute the natural oils so your hair will look less greasy. As for the bamboo toothbrush (which is biodegradable, save for the bristles), it is way more ecofriendly. In the US alone, one billion plastic toothbrushes are thrown away every year and they alone produce 50 million pounds of waste. That’s insane! Especially when ecofriendly alternatives are available. So far I think I’ve done pretty good with regards to my zero waste efforts. What zero waste efforts are you making?